Weakness of the rule of law and prevalence of impunity is alarming in Sri Lanka where critical elements for the protection of Human Rights have been undermined or compromised despite the existence of much of the necessary human rights institutional infrastructure, said the United Nations High Commissioner for Human Rights, Louise Arbour, concluding her five-day mission to Sri Lanka on Saturday. The large number of reported killings, abductions and disappearances, is particularly worrying in a country that had a long, traumatic experience of unresolved disappearances and no shortage of recommendations from past Commissions of Inquiry on how to safeguard against such violations, she said. 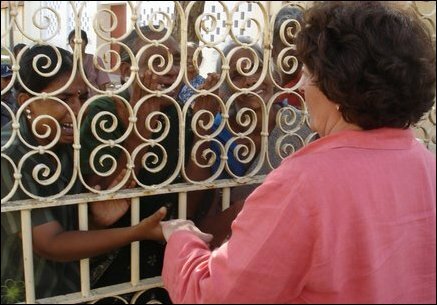 "In the absence of more vigorous investigations, prosecutions and convictions, it is hard to see how this will come to and end," warned Ms. Louise Arbour in a press statement issued in Colombo. "While the Government pointed to several initiatives it has taken to address these issues, there has yet to be an adequate and credible public accounting for the vast majority of these incidents," she said. "While Sri Lanka has much of the necessary human rights institutional infrastructure, critical elements of protection have been undermined or compromised. The application of treaties in domestic law has been questioned by the Supreme Court in the Singarasa case. The Government's proposed legislation to address this problem, tabled this week in Parliament only partially addresses the issues and risks confusing further the status of different rights in national law," she said. "It would be highly desirable for the Sri Lankan government to consider an early ratification of the new International Convention for the Protection of All Persons from Enforced Disappearance." "In light of the documented violations of international humanitarian law, Sri Lanka should seriously consider joining the 105 countries which have ratified the Rome Treaty creating the International Crime Court," she said. "I regret that time did not permit me to visit the Eastern Province. I also regret that I did not have the opportunity to visit Kilinochchi, where I would have liked to convey directly to the LTTE my deep concern about their violations of human rights and humanitarian law, including the recruitment of children, forced recruitment and abductions of adults and political killings," she said. "I am very concerned about by the many reports I have also received of serious violations by the TMVP and other armed groups." 11.05.10 Arbour to campaign for independent war-crimes inqu..
13.10.07 Welikade detainees call off fast-unto-death campai..
13.10.07 UN alarmed by weakness of law, prevalence of impun..